Tutorial: Bleeders – Friend or Foe? 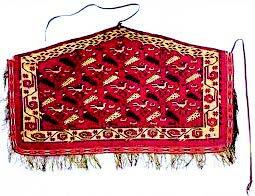 Some cleaners are afraid of taking oriental rug jobs because the colors may run. Sometimes it’s good to be afraid, but can bleeders be your friend? YES THEY CAN! Think about it from your customer’s point of view, they fear that their colors will run too! They are hoping to find someone who knows how to deal with it. By helping them solve color bleed issues, you can become their rug exert and make some extra profit too. Unfortunately there ar several causes of color failures. Let take a look at a few and see how we can all profit from them. 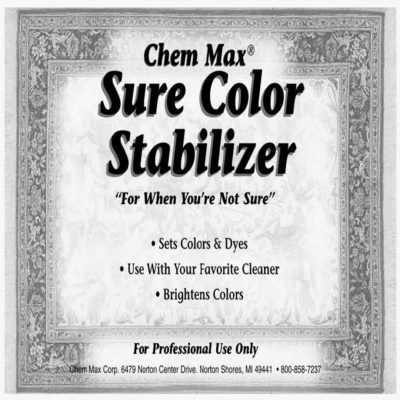 Dyes by definition are water-soluble. 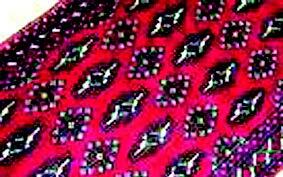 Originally dyes were leached from plant materials and used to colorize fibers. Most will wash out unless the dye has been “fixed” or “set” with a mordant. 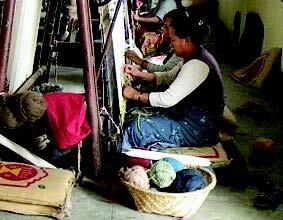 Mordants are compounds, which provide a bridge between the dyes and the fiber. (Some dyes do not need mordants, for example va dyes, like indigo, require oxidation to be colorfast.) The term ‘mordant’ comes from the Latin word, “morders,” to bite. It was thought that a mordant helped the dye bite onto the fiber so that it would hold fast during washing. More accurately, the soluble dye molecule becomes an insoluble molecule when the mordant bonds to both the fiber and the dye. the new larger molecule is called a dye lac or dye lake. The dye is now colorfast. the long-term value of your client’s rugs and make it much easier to clean. 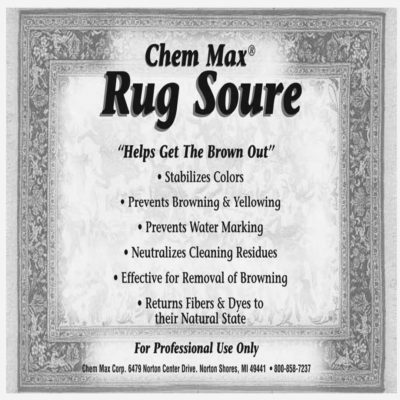 Of course, you will want to charge extra for this value added service, adding extra profit but more importantly, YOU are now their expert rug cleaner. Volumes have been written about the plethora of mordants available for dying. Keep it simple by applying an anionic mordant like Dye Fix for Wool or Dye Fix for Silk on protein fibers before cleaning. 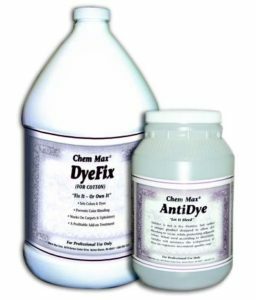 Use a cationic blend like Dye Fix for Cotton on cotton, linen and other cellulosic fibers. Post-mordanting is quite effective on protein fibers (silk & wool), and less effective on cellulosic (cotton, linen, etc.) fibers. 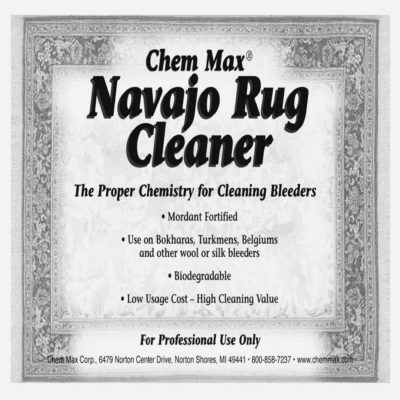 Navajo Rug Cleaner contains mordants to help stabilize colors during cleaning. It can be helpful on problem bleeders (i.e. Navajos, Bukharas, Turkomans, etc.). 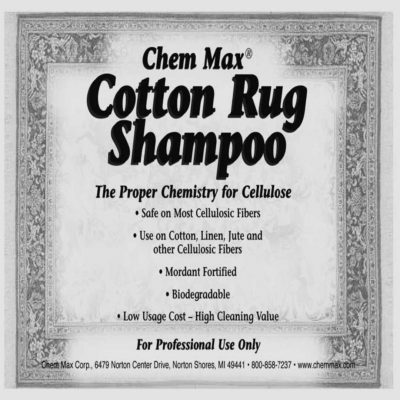 On cellulosic bleeders, which require all the help they can get, using both Cotton Rug Shampoo and Cotton Rug Rinse is almost a requirement. Many cleaners simply turn down all cellulosic bleeders – sometimes it is wise to be afraid, but if you want to clean them, you need to use every trick in the book. test each color with your cleaning solution and a white cotton towel. If you find color transfer, or you see signs of bleeding on the rug, point it out to your customer. Explain how this pre-existing problem can be remedied by the application of a mordant like DyeFix. Quote this corrective service around $1.00 to $2.00 per square foot or more. If you get the go ahead, you both gain. A true WIN-WIN! If you are turned down, explain that you can still clean the rug but the customer will need to sign a Release of Liability form, which states that you are not responsible for any pre-existing problems or additional color damage. 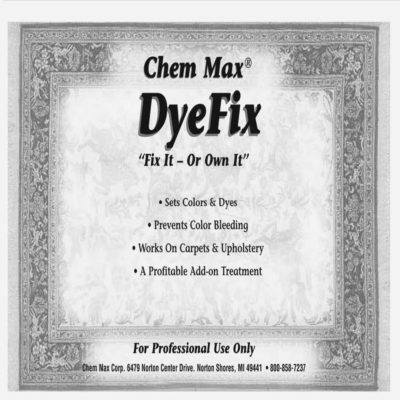 Some cleaners apply Dye-Fix mordant whether or not the customer pays for it. 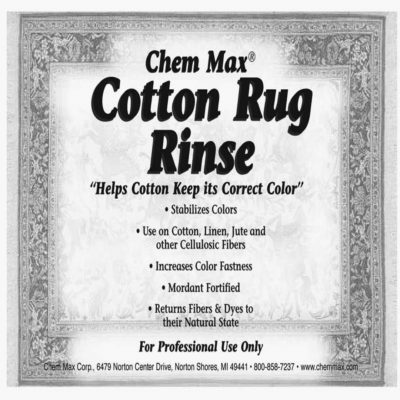 Others use AntiDye to prevent dyes from redepositing on adjacent fibers, protecting the rug from bleeding colors. If the rug is already damaged from bleeding, you can use Rug Resurrection and/or Dye Stripper to remove unwanted colors. © 2012 Chem Max Corp.